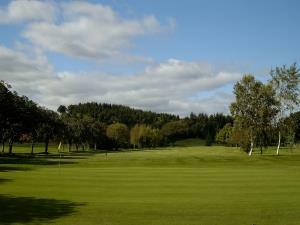 Builth Wells Golf Club01982 553296work Golf - 18 holeBuilth Wells Golf Club is a stunningly beautiful 18 hole parkland golf course situated in the picturesque Mid Wales countryside just a short drive from the historic market town of Builth Wells. The course is unique in that there are no par 5’s for the men. The course is made up of 12 par 4’s and 6 par 3’s. The course measures 5424 yards, par 66 for men and 5317 yards, par 70 for ladies and is as much a challenge for the scratch golfer as it is for the high handicapper. Many holes require accuracy off the tee and well guarded greens mean precision is also needed for approach shots. Where many courses do not allow visitors on weekends we are more than happy to accommodate any visiting golfers/societies. As a group of very satisfied visitors commented "from the time we arrived to the time we were leaving the whole experience at Builth Wells Golf Club is one not to be missed”. Buggies are available for hire at £18.00 per round, electric trolley's at £6.50 per round and pull trolley's at £2.00 per round. Course planners are available to plot your way round the golf course for only £3.00. After 16:00 any day when course is free - £12.00 weekdays. A 50% reduction on the above rates is applicable to persons who have not attained the age of 18 years.